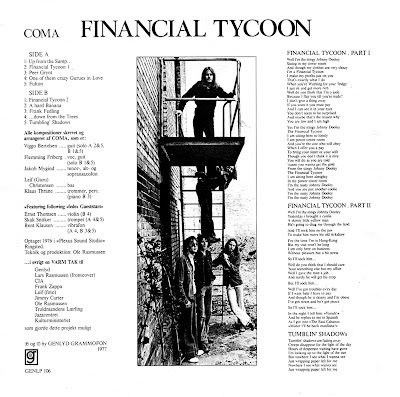 Great and very rare (fetching up prices higher than 100 EUROS) Danish prog rock,with obvious Zappa -esque style jazzy influences .“Financial Tycoon” is like a direct cross between two of Denmark’s finest bands: Dr. Dopo Jam and Secret Oyster. From Dr. Dopo Jam they inherit the obvious Zappa influence, including humorous bits and complex composition style. From Secret Oyster they get the fusion tendencies and instrumental dexterity. Some splendid sax and ripping guitar solos really add spice to the album. "The treasure trove of innnovative Danish rock is still opening up to the world thanks to some recent reissues of bands like Ache, Burnin' Red Ivanhoe and Day of Phoenix, but generally such events are too far and few between. One band still unreleased on CD format is that of the late 70s group Coma. Creating similar music to that of country-mates Dr. Dopo Jam, Coma recorded their debut album, Financial Tycoon, with a sound that seemed a few years too late, bringing in jazz and Zappa influences to create a music both humorous and agile, leaping from style to style and instrumental to vocal section with abandon. Instrumentally, Coma rely on a line up similar to that of Kraan's early years with their horns/winds, guitar, bass and drums formation, while being larger personnel wise. There are several vocal sections throughout, all in a quite acceptable English, allowing us to hear some bizarre lyrics that might not go over so well in today's overly politically correct society. 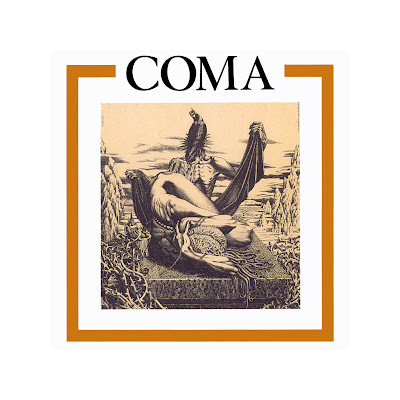 However, while these are quite amusing, Coma's instrumental work is their strength and there are just loads of long, warm instrumental sections with plenty of solos, and these are where the Zappa influences come in, especially in both structure and the occasional addition of tuned percussion. Of course, there must have been an influence on the lyrics as well, as song titles like "One of Them Crazy Gurues in Love" and "Hard Banana" attest. This is a genuinely interesting jazzy inflected progressive rock oddity that is long overdue for reissue." PS:This one was posted along with their 2nd LP by Mystery Poster blog but now it seems links are dead. Need to get amuck with Amoc Amoc Amoc! The album is incomplete... I 'll update the post as soon as I 'll rip my vinyl. MIL GRACIAS POR ESTE DISCAZO, Y POR ESTA INCREIBLE PAGINA. ¿ALGUIEN SABE DONDE PUEDO ENCONTRAR EL DISCO COMPLETO? I don't at all mean to seem rude, but what do I do when I've been asking about something [missing tracks from Coma's Financial Tycoon album] for weeks and all enquiries are ignored? I sometimes have asked in other threads hoping that I will be noticed because they are more recent threads - but it is very easy to forget where I've done this so I come back again to the original post for Financial Tycoon to leave my comment/question/plea. I really love your blog but the communication with us is almost non-existent - well, at times it seems it's just me. Nice album, except all the tracks are indexed wrongly, and 6 minutes of the last track is missing. Please re-upload correctly!